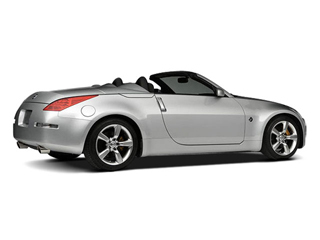 Nissan's 2009 350Z manages to capture all the excitement of the original Z car. The car's styling is remarkable, handling is taut and performance is thrilling. Datsun forever changed the world of affordable sports cars when they launched their sleekly styled, 6-cylinder missile, the Datsun 240Z, in 1971. 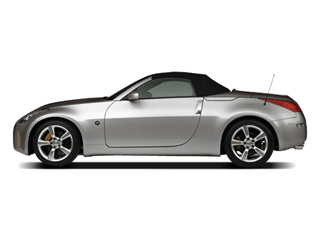 Six years after the Z car's reintroduction to the U.S. market, the 2009 Nissan 350Z happily stays true to the 240Z's successful blend of performance, style and reasonable price. 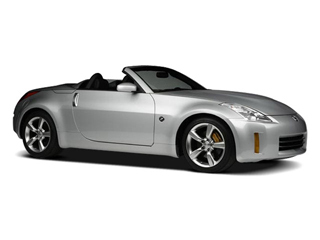 The 350Z shares its platform with the INFINITI G35 sedan and G37 coupe. These cars all use Nissan's FM (front/mid-engine) platform that places the engine behind the front axle line for optimal weight distribution, resulting in excellent handling. The 350Z uses the fourth-generation 3.5L, 24-valve DOHC V6 which in this application, makes 306 horsepower and 268 lb-ft of torque. A 6-speed manual and a 5?speed automatic transmission with down-shift rev matching are available. 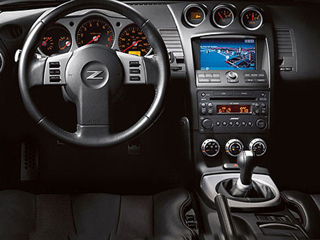 Inside, the Z is obviously a pure driver's car. The tachometer is large and directly ahead of the driver. When you release the tilt lever the whole instrument pod goes up and down with the steering wheel. It's a thoughtful detail that ensures a great view of the instruments at all times. The three small round gauges atop the center of the dashboard echo back to the original Z car, and a large storage compartment opens right below it. This is where the GPS system resides if you choose this option. Everything in the cockpit is pointedly styled, and just flat out works. Even better than the interior is the driving. Nissan obviously went to a lot of trouble to make the Z chassis an exceptionally stiff one. Under the hood a brace connects the two shock towers. There is also a larger cross member that takes up a significant amount of rear cargo area. The Z's power is magnificent. The stiff chassis makes for a firm ride, but it also elevates the handling prowess significantly. The ABS-equipped 4-wheel disc brakes are absolutely fantastic. The 350Z has a number of trims, including Enthusiast, Touring, and Grand Touring. The Enthusiast gets a limited slip differential, traction control, cruise control, drilled aluminum pedals, an auto-dimming rearview mirror and a HomeLink transceiver. The Touring adds heated perforated leather seats, available navigation system and a 7-speaker premium Bose audio system with in-dash 6-disc changer. The Grand Touring adds Brembo brakes and vehicle dynamic control.